I love animals & animals love me!! It's a lifetime love affair. You can't fool a dog or cat into thinking you adore animals & understand their needs, they just 'know', that's why I've had so many people comment how surprised they are that their normally apprehensive or timid companion animal runs up to me for a scratch & cuddle. By all accounts I am somewhat of an animal whisperer!! I've had quite a list of animals throughout my life, from mice, cats, fish & birds, to a Samoyed, Border Collie & now 2 Siamese girls, who are the biggest personalities in little bodies I've ever met. I can not imagine my life without animals & would absolutely love to look after your babies & give you peace of mind when you need to be away from them. I know we would get along & have super fun until their favourite people return home. I also have a lucky & uncanny knack for rescuing native animals, including a rare feather glider (see photos) & a tortoise in just the last few months. Aggi is a great pet-sitter and we would happily book her again. She has an obvious love of animals along with the wisdom of experience- she knows the job! I felt very comfortable giving her the responsibility of care for our pets and they instinctively became Aggi's instant friends. Thanks Aggi! Once again Aggi took extra special care of the kitties, and they just love her! 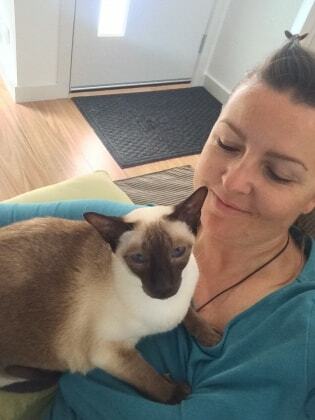 I am also a qualified human massage therapist & have experience with cat & dog massage. I have experience with feeding tubes & animals requiring special care.